Pedal around a seaside town — such as Rovinj, Croatia — to experience the quieter side of Europe. In Europe, an afternoon on a bike — or a day, or weeks on end — gets you close to the ground and close to the people you came all this way to meet. Europeans love bicycles, and they are often genuinely impressed when they encounter Americans who reject the view from the tour-bus window in favor of huffing and puffing on two wheels. Your bike provides an instant conversation piece, the perfect bridge over a maze of cultural and language barriers. While my schedule usually won't allow a week-long pedal in the Loire Valley, I'll often do day trips in or around cities. 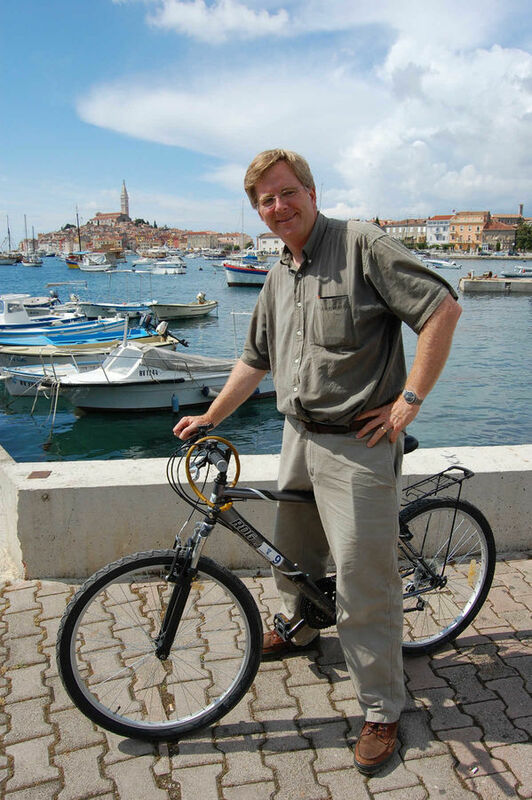 I feel local, efficient, and even smug with my trusty and well-fitted bike. Especially during rush hour, I can get across town faster on my bike than by taxi or tram. Europe's cities are striving to become more bike-friendly. Dozens of them have joined a European Union initiative to make bicycles on par with cars as a form of urban transport. The progress is gradual. Some cities (such as Rome and Athens) are not yet set up well for bikers, but quite a few (particularly Stockholm, Amsterdam, Copenhagen, Lucca, Florence, Salzburg, Munich, and Bruges) are a delight on two wheels, offering an extensive network of well-marked bike lanes. In these cities, rather than relying on walking or public transportation, consider making a bike your mode of transport. Bikes cut transit times in half compared to walking, giving you more time to spend at the sights. Rental bikes are bargains at $15–25 per day (the best deals are for multiple days). Helmets are usually available, but may not be automatically offered — ask. Bike-rental shops generally provide strong locks. Europe's bike thieves can be bold and brazen...and quick. Always lock the frame (not the wheel) to the permanent rack. Many places (including Barcelona, Copenhagen, Dublin, London, Paris, Stockholm, and Vienna) have citywide programs in which hundreds of free or very cheap loaner bikes are locked to racks around town. While tourists can easily take advantage of these programs in cities like London and Vienna, in other places (Dublin), the systems are designed mostly for residents (some require a membership or only take European-style chip-and-PIN credit cards). Also, the bikes are very basic, sometimes in disrepair, and often plastered with ads. If you're serious about biking, pay to rent a good one from a shop instead. For a quick but meaningful spin around town, consider a bicycle tour. 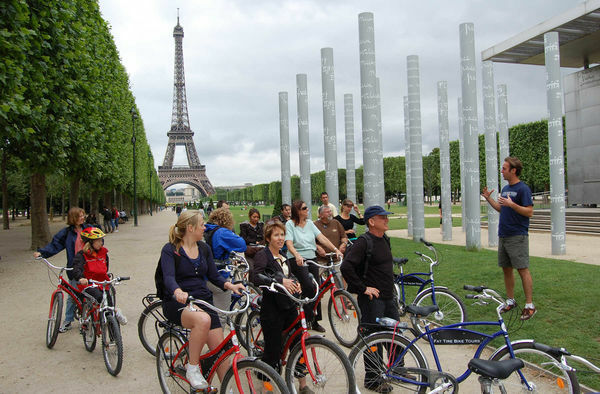 Guided bike tours are popular in cities throughout Europe (especially Amsterdam, Barcelona, Bruges, Paris, Munich, Berlin, and Budapest), as well as many bike-friendly countryside areas. You'll get a young, entertaining, often foul-mouthed, sometimes informative guide who will give you a breezy introduction to the city and a close-up look at back streets few tourists ever see. The various companies — generally started by disgruntled employees of other bike-tour companies — are highly competitive, and come and go all the time. Tours are typically fun, reasonable (about $25–30), good exercise, and an easy way to meet other travelers as well as get a new angle on an old city. Biking in the boonies (using a small town as a springboard) is extremely popular in Europe. Thanks to the law of supply and demand, you can generally count on finding bike-rental shops wherever there are good bike-tripping options: along the Danube, the Rhine, and other idyllic river valleys; around Ireland's Dingle Peninsula; on Greek islands; and in the Alps for mountain biking on service roads. In many countries (especially France, Germany, Austria, Belgium, and the Netherlands), train stations rent bikes and sometimes have easy "pick up here and drop off there" plans. For instance, if you ride the train into Amsterdam, rent a bike at the station for a few days to get around the city...and out into the tulip fields and windmills. If you're interested in long-distance biking, figure out how much of Europe you want to see. With an entire summer free, you can cover a lot of ground on a bike. But with a month or less, it's better to focus on a single country or region. Consider bringing your bike from home, but be sure to check your airline's baggage policies for fees and restrictions. It could cost you $100–400 to bring your bike, and you may need to reserve a spot for it when you book your plane ticket. But if you're planning to ride a bike for more than a week, the cost of bringing your own may beat the cost of renting one in Europe, where bikes are more expensive than in the US. And having your own bike means you'll know that it works well for you. Carry along the tools you'll need to get your bike back into riding form, so you can ride straight out of your European airport. Unless you love bike camping, it makes sense to stay in hostels, hotels, or guesthouses, since it frees you from lugging around a tent and sleeping bag. If you'd rather let someone else carry your gear, try a bike tour (offered by REI and many other companies). Don't be a purist. Taking your bike on a train can greatly extend the reach of your trip, and there's nothing so sweet as taking a train away from the rain and into a sunny place. You can find many good books on cycling in Europe, along with online info (such as Europe Bicycle Touring).